Movie Review: Promising were the first scenes of “A Second Chance”, a psychological crime thriller from the Danish filmmaker Susanne Bier, who filmed again in her country after the unexcitable American-French drama “Serena”, which once more gathered the trendy leading actors, Bradley Cooper and Jennifer Lawrence. Unfortunately, the disquieting beginning soon slides into something, not only dark but ghastly, as well as revelatory but also disproportionate and strained. The grim plot, written by Bier’s long-time collaborator Anders Thomas Jensen (“Brothers”, “In a Better World”), is certainly his heaviest, and tells the story of Andreas (Nikolaj Coster-Waldau), a cop who reconnects with a known dangerous psychopath and heroin addict, Tristan (Nikolaj Lie Kaas), whose girlfriend, Sanne (May Andersen), called the police in an attempt to protect herself and their baby who was lying down inside a closet in deplorable conditions. This instance had emotional repercussions in Andreas who ran home to make sure his own little baby and his fatigued, vulnerable wife, Anne (Maria Bonnevie), were ok. At a first glance, everything was fine, but when unexpectedly the baby dies, the couple acts in a very distinct way. She completely freaks out, acting insane, while he maintains an earnest calmness but already with a not less insane plan in his mind: drop off his inanimate baby at the heroin junkies’ and steal theirs, in an attempt to ease the suicidal Anna. The brute Tristan, only thinking about how to avoid being sent to jail again, decides to simulate a kidnapping. 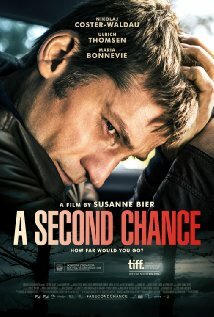 Cold, depressing, and quite messy, “A Second Chance” takes the emotions to an extreme that doesn’t make it easy for the viewer to empathize with any of the unbalanced characters. Among the grievous performances, Mrs. Bonnevie stood out, in a screwed up tale that, even before halfway, made me lose hope in its personas. Mrs. Bier delays getting out of the tortuous cinematic paths she keeps embarking lately.